Horsham Rural City (map) is a vibrant, diverse community situated approximately 300 kilometres north-west of Melbourne and north of the Grampians National Park, in the heart on the Wimmera region of Victoria. The municipality has a population of over 19,000 people and covers an area of 4,249 square kilometres. Almost three quarters of residents live in the urban area of Horsham. Horsham is the major provider of retail, community and government services in the Wimmera, with dryland broadacre being our major industry. The Grains Innovation Park, a nationally acclaimed agricultural research centre, is based in Horsham. The industry diversity in our city creates a business environment for success today and potential for future development. While existing sectors continue to thrive and grow, new and emerging sectors add strength and vitality to the business landscape. There are a range of quality educational and health care facilities including secondary colleges, a university and an agricultural college. We also have a diverse array of natural assets including recreational lakes, wetlands, the Wimmera River, Mount Arapiles, the Wartook Valley and the Grampians National Park is nearby. This website presents economic and demographic insights for Horsham Rural City. For further information and assistance in relation to business and investment please contact Horsham Rural City Council’s Director of Planning & Economic, phone 03 5382 9717. The industrial economic data presented in this profile has been sourced from REMPLAN. 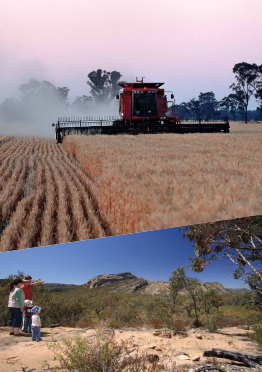 Horsham Rural City Council has access to the full version of REMPLAN with economic data for 114 industries and an economic impact modelling capability. For additional information about the Horsham economy please contact the Horsham Rural City Council Economic Development unit.